Today has been a pretty miserable day weather wise, and the forecast doesn't look great for the next few days either. If it stays like this I might have to rethink my plans. 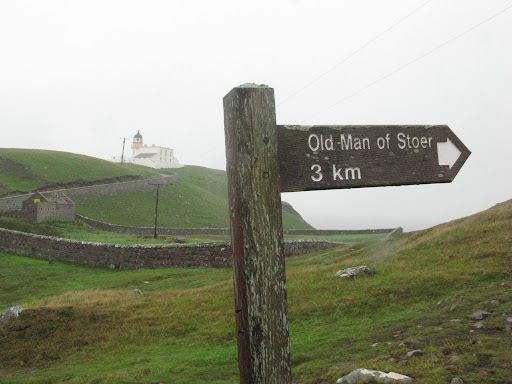 It didn't stop me this morning though, as I decided to brave the mist and rain and do the 3km walk to the Old Man of Stoer. The car park was deserted as I set off this morning, and no wonder, as it was raining, and there was very bad visibility. If I hadn't already been there from last night, I might not have bothered to start out on the walk, but since I'd come all the way here I might as well do it, I thought as I squelched off along the waterlogged path. As I was making my way along, careful not to get too close to the edge on the slippery grass, I wondered would I be able to see anything when I got there – it was not easy to see any distance at all, and I was missing out on some great sea cliff views. 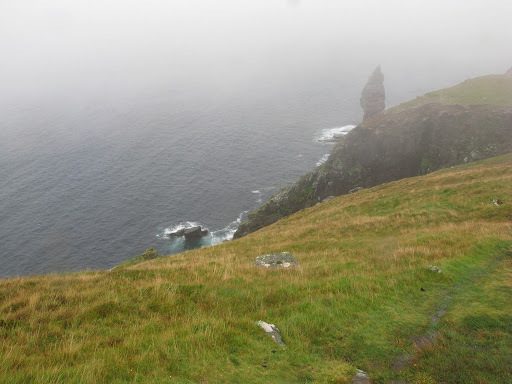 I could tell form the occasional glimpses through the mist to the waves crashing below the high cliffs. It did feel good to be out doing something though, even though it didn't take long for my socks to start feeling damp through my boots. 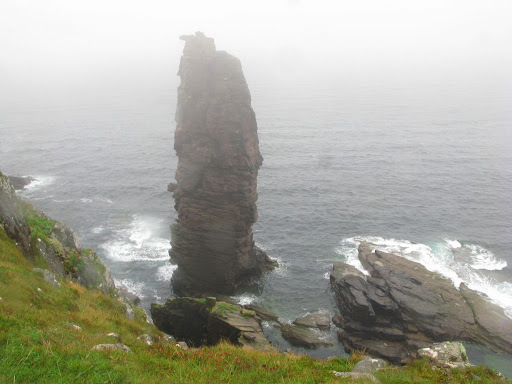 Eventually after walking for about an hour I was rewarded with my first glimpse of the sea stack.. I was lucky, as the cloud was just clearing a bit as I reached the place, and the viewpoint was pretty spectacular, looking down a boulder covered hillside and over a cliff to the Old Man himself. After making my way down the slope I looked for the best views of the tower itself, and rested up for a while, looking over the edge to the view below.. 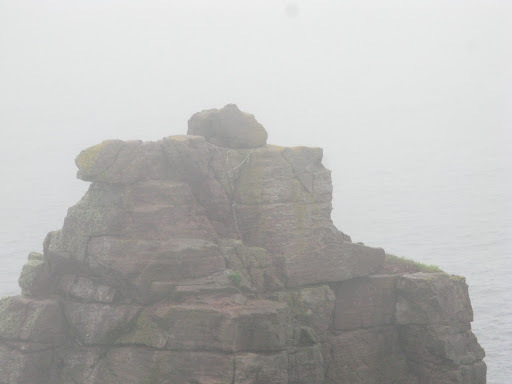 Looking closer I could see that there are still the remains of some climbing ropes attached to the boulders on the very top of the sea stack – it wouldn't be a great day for a climb I was thinking, and how did they even get down there to begin? The rest of today, I've been driving along in the rain, checking out a few places along the way, but mainly looking for a good spot to camp up and rest. The weather has been pretty nasty all day, and I haven't really been in the mood to go sightseeing. I've actually come further than planned and ended up in Blairmore at the walkers car park, at the head of the path to Sandalwood bay. Its a four and a half mile walk to the bay, which is supposed to be a stunning remote location, but if the weather is anything like today, I don't think I'll be going there – at least not tomorrow. Maybe I'll explore further north and then return here on the way back down. Lets see.